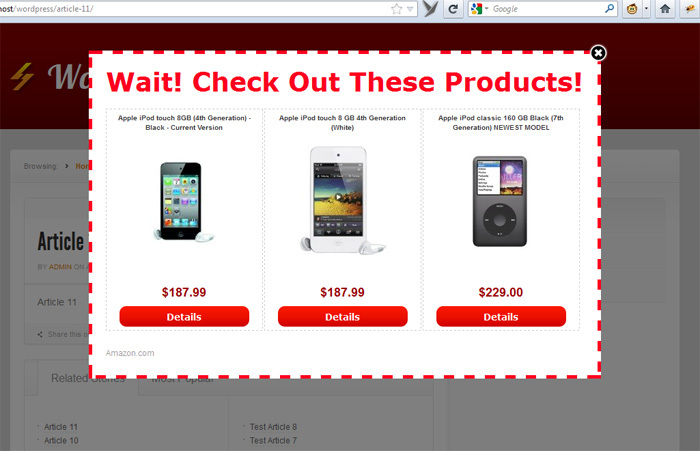 Check out screenshots below or enter your domain on the top to preview your site. WP Bounce comes loaded with features like ability to split test title messages, advanced analytics graphs, easy to customize layout. Our talented team is constantly adding new features. 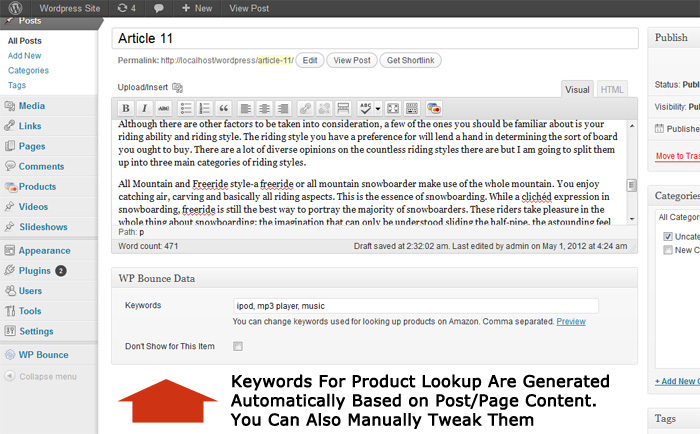 WP Bounce generates keywords based on post/product content. They are used to pull relevant products from amazon.com. Customize look and feel of your pop ups. 2 Amazon and 3 custom HTML templates are available. Split test them to increase conversions. 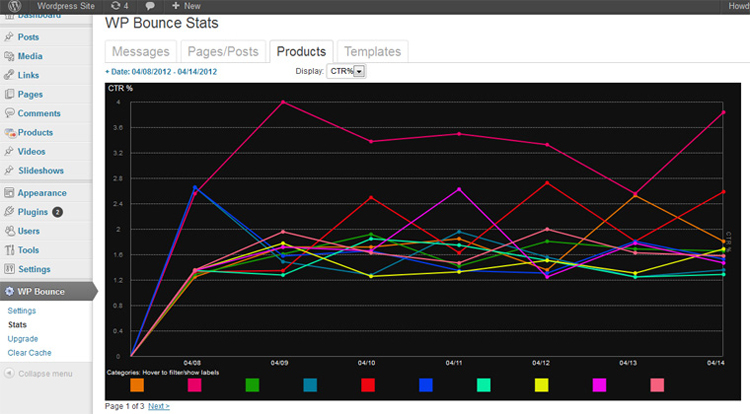 Analyse pops, clicks and CTR for messages, products, posts and templates. Split test messages and templates to increase conversions. 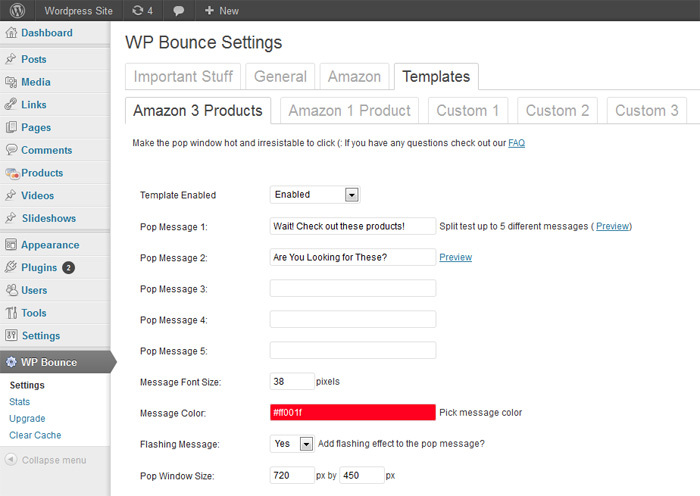 WP Bounce picks up SERP keywords and uses them to pull relevant products from amazon.com. Huge CTRs! WP Bounce doesn't trap visitor's window. It doesn't interfere with the 'back' button. It uses lightbox overlay window so it's SEO safe. WP Bounce can pull products from amazon.com, .co.uk, .ca, .de, .fr, .jp, .es., .ch, .it amazon sites based on visitor's ip. Would You Like to Increase Commission Earnings From Your Blog? If you're promoting Amazon products like me you probably have a few amazon stores built. I have about 60 amazon sites I run on a side besides working full-time as a professional web-developer. They constantly bring in a good sum of money and it's nice having an additional income. At the beginning of 2012 two of my highest earning sites got hit by google algorythm changes. My Amazon earnings started to go south and I was desperately looking for ways to recover my income stream. After searching a lot here on warrior forum and other forums I quickly made some changes to my sites and waited to see results. I was still getting some traffic just not as much as before. I knew I should start optimizing conversions of existing visitors. I started to look for ways to increase my click through rate. First thing that came up was to try some exit pop scripts. I tried a few plugins. While some of them only allowed for email opt-ins others allowed amazon products but you had to enter them manually. It was taking forever to manually find and enter each product for every page on my site. I was tired of this BS and since I had all the skills needed I decided to build my own plugin that would pull amazon products automatically. It took a few months to build all the features and to get it where it is now. And it turned out amazing! 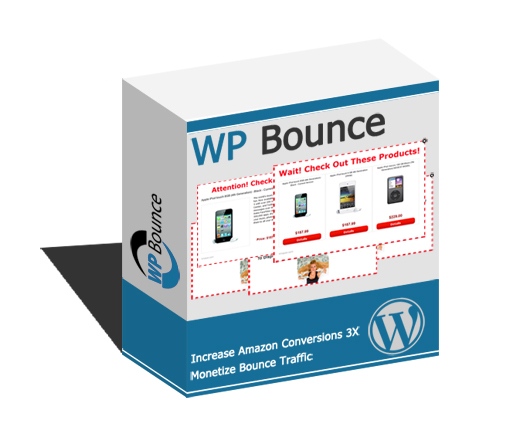 WP Bounce 1.5 So You Can Start Getting BIGGER CHECKS Too! 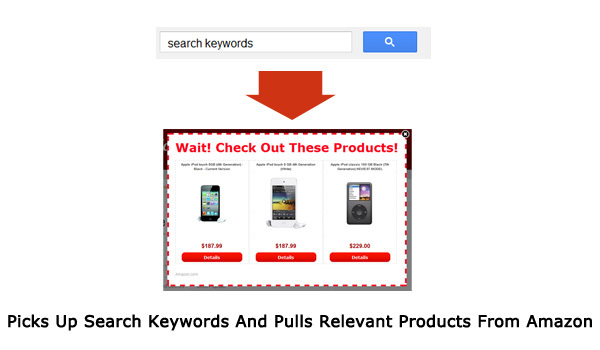 Everything from generating keywords to pulling relevant products from Amazon is automatic. It saves you time. You simply install it once and forget it. Use saved time to work on your other projects or simply enjoy doing what you love. Increase Your Click Through Rates -> Get Bigger Checks! 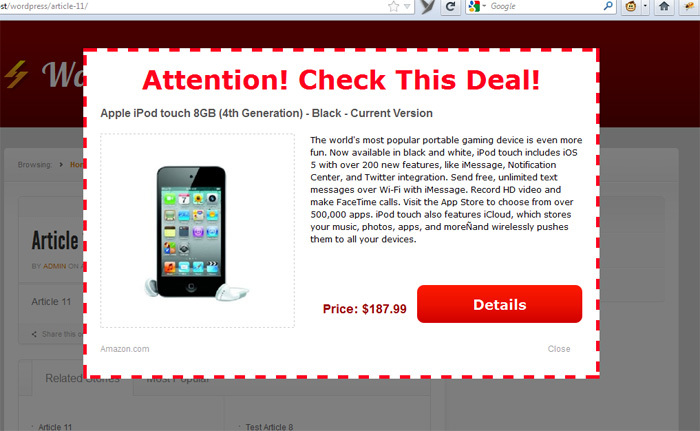 If you already have an amazon store this plugin will do wonders for your CTR! Imagine getting a second chance to pitch your visitor a few more deals right before they are about to leave.You could easily be sending 300% + more clicks to Amazon. How much more money does that equal to you? 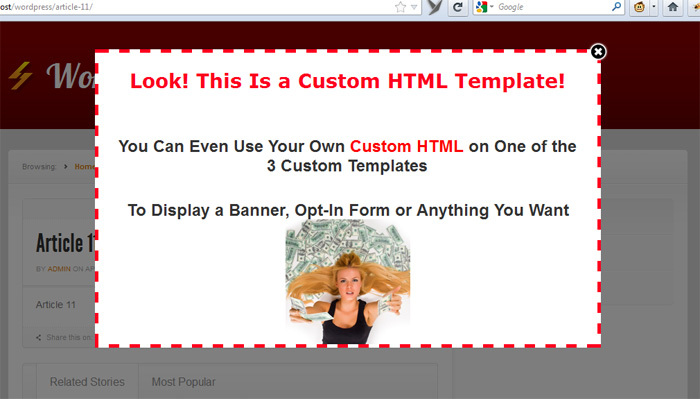 5 Easy to Customize Templates. Split Test Your Way to Riches! 2 with amazon products and 3 custom HTML templates. Make the pop window layout match your site design for better conversions. Split test templates to find exactly what works for your site and what doesn't. Easily disable losers or continue testing other variations like email opt-in forms or click bank products. Split test 5 different attention grabbing titles per every template. Any successfull internet marketer will tell you how important it is to split test and optimize to squize even more revenue out of your traffic. Want to See How it Looks Like? Preview Your Own Site Now! See exactly how many pop ups, clicks and CTRs WP Bounce generates for any given day. The statistics are available for title messages, posts/pages, products and templates. Use the stats to see what attracts the most clicks and brings more cash for you. WP Bounce picks up SERP keywords the visitor use to get to your page and uses them to pull super-relevant products from Amazon. It gives your visitors exactly what they are looking for. It's like searching amazon for them and showing the links to products they are looking for. Imagine what this will do to your CTR and conversion rates! Picture this scenario. A user searched for 'blue widgets for women' and your site came up but your page is about general 'blue widgets'. Right before the user tries to leave - WP Bounce shows a pop up with 'blue widgets for women' and you get that click and the commission that otherwise would have been lost! I won't be surprised if on some of your sites WP Bounce earns you more money than the actual content itself. Location Aware! Never Lose a Conversion From International Visitors Again! Did you know that if your site promotes products from amazon.com but if the visitor from the UK clicks through and buys you don't get paid for that conversion? Unfair you scream? I agree. That's why I made the plugin work with all 9 amazon sites: amazon.com, amazon.co.uk, amazon.ca, amazon.fr, amazon.de, amazon.jp, amazon.cn, amazon.it, amazon.es. 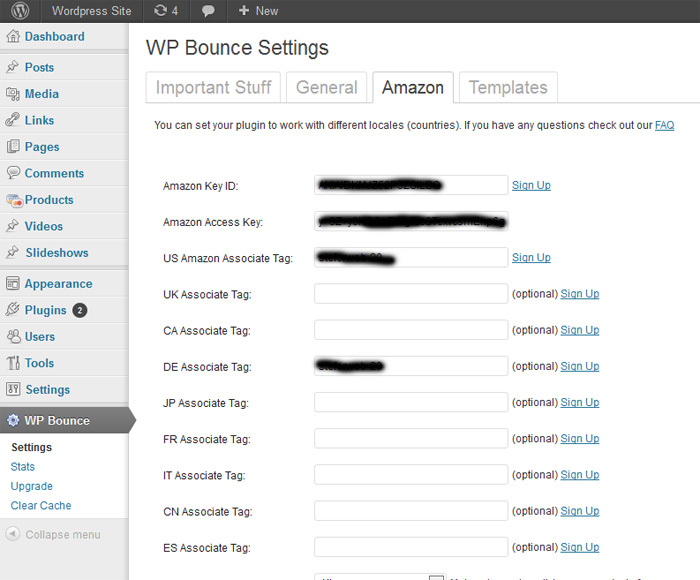 WP Bounce automatically recognizes visitor's country by their ip and sends them to the appropriate amazon site. You can be making commision from every amazon site with any amazon associate program you sign up. You might have been losing 30-40% of your conversions before but WP Bounce will ensure that you get paid every dollar you earn! So, Are You Ready to Increase Your Amazon Conversions? Disclaimer: Amazon and other brand names and logos are registered trademarks of their respective owners. Any and all brand name designations or references are made solely for purposes of demonstrating compatibility. This site and the products and services offered on this site are not associated, affiliated, endorsed, or sponsored by Amazon, nor have they been reviewed tested or certified by Amazon. Copyright © 2019 Rich Ways LLC.